Togue Guisado is a simple vegetable dish of sauteed mungbean or mongo bean sprouts, usually served as a side dish to a rice/meat meal. 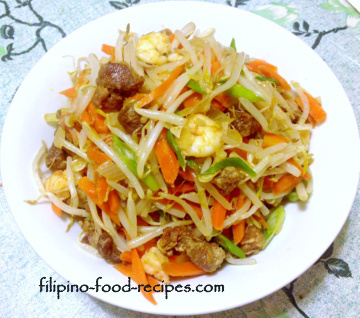 The basic ingredients for this recipe are togue or mungbean sprout, carrots and green onion. Also, fried and cubed tofu or tokwa is standard but can be left out if strips of pork, beef or chicken is available. Sauteing starts with the garlic and onion -- and adding tomatoes and bell peppers is optional, depending on one's preference. My mom doesn't put tomatoes because she says dishes sauteed with tomatoes tend to go bad fast during warm weather. Also, she uses left-overs for this dish to make the Lumpiang To gue, that's why she skips putting the bell peppers. 1 Saute the garlic and onion, add the pork or chicken, shrimp, tofu and fish sauce and cook for a couple minutes. 2 Add the mungbean, and shrimp broth and cook for 3-5 minutes. 3 Season with salt(as needed) and pepper, and turn off the heat. 4 Stir in the green onion. Try to cook the mungbean sprout briefly to make sure it retains its crunchy texture. It is not appetizing if they get soggy. Wash the mungbean sprouts by soaking in a lot of water. The green mungbean skin will float on the surface and easy to discard. Convert left-overs and make Lumpiang To gue or even Ukoy.